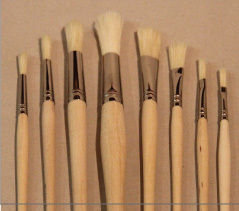 Painting brushes/tools – PELI Glass Products B.V.
You will get the best glass and ceramic painting results by using the right paintbrushes and tools with the right paints. 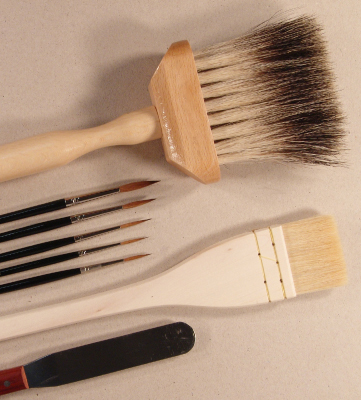 All of our paint brushes and tools are designed and made specifically for glass and ceramic painting. Contour lines – sable and ox hair. 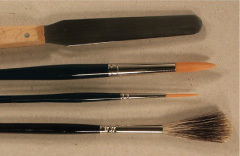 These are flexible brushes that hold paint for making a line. 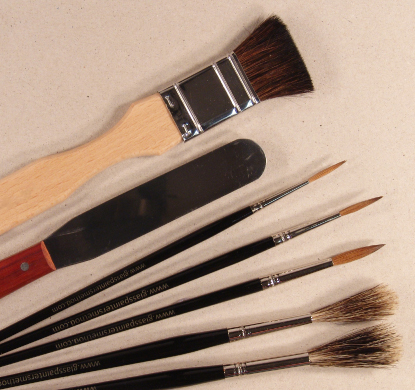 Sable brushes hold lots of paint and are the choice of the professional; ox hair brushes are more economical, and also a dependable choice. 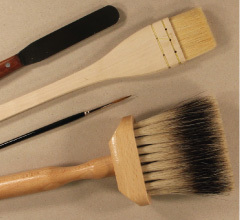 Grisailles – one needs brushes for applying the glass paint (matting brushes, Hake brushes, fan brushes) and very importantly, Badger Brushes for spreading the paint into a thin, even layer. 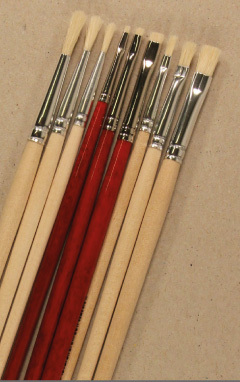 PELI Badger Brushes are very soft, easy to control, long lasting and work well with glass paints regardless of the amount of Arabic gum added. Shadows and highlighting – we offer glass painting stipplers in a variety of shapes and sizes for shading effects, as well as a duck and crow quill brushes specifically for special glass painting effects. 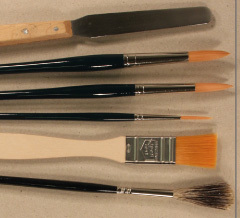 Sturdy palette knives, glass painting bridges made from hardwood, sponges and spritzers for creating special effects, as well as containers for storing paint. New items are added on a regular basis, so be sure to sign up for our e-newsletters. At PELI Glass, we’re also glass painters – so anytime you have a question, let us know and we’ll be pleased to assist you, gratis. All of our glass and ceramic painting brushes are hand-made to our specifications and we guarantee them, and all our tools, unconditionally. If you’re not satisfied, just let us know, and we’ll work to make you happy. Would you like to have a non-binding offer for any items? Let us know today! Send us an email at mail@peliglass.eu or call us at +31(0)79 361 8154. Be sure to sign up for our e-newsletter to receive information on special offers and painting tips.